If you love the thrill of booking a great flight deal, you likely also know the frustration of having to sort through dozens (or even hundreds) of posts to find one from your airport for dates you want to travel. Plus, it seems like every day we hear about another website that promises to deliver the best option for you. Following all of these sites looking for a perfect flight deal can take a substantial amount of time. And, while you’re looking around, you’ll likely end up seeing the same deal on multiple sites. Update 11/13/16: Since posting our review a week ago, All The Flight Deals has worked to address the drawbacks mentioned below. The site now gives you the option to limit the search results to the “deal airlines” and is refreshing the flight search results more often as well. What if there was a way to simplify it all? Well, the creators of Book With Matrix are back with another useful tool that fills in the gaps of finding and booking cheap travel: All The Flight Deals. All The Flight Deals is an easy-to-use tool that aggregates many flight deal websites. Like with Book With Matrix, the premise is simple: True to its name, All The Flight Deals collects all of the flight deals from many different flight deal websites. But, the service doesn’t stop there. Rather than just being a simple aggregator, the service validates with flight booking engines that the flights are actually bookable at this rate and, if so, on which dates the fares are available. So, you no longer need to dig through Google Flights calendars or search random date pairs in Momondo looking for the headline deal price. You’ll know at a glance when and where the flights are and aren’t available. The website officially launches this weekend, but All The Flight Deals has been working in beta mode for a few weeks now. We took a look at what the service has done so far, and here’s our take. Anyone can visit All The Flight Deals and should be able to easily navigate through the website. Straight-forward website: Unlike Book With Matrix, All The Flight Deals doesn’t assume that you have prior knowledge of any website or service. Anyone who goes to the site should have no trouble navigating the straightforward interface. Free service: With more and more paid subscription flight deal services popping up, it’s nice to see a new service that innovates on the free model. While we don’t know the exact revenue model for the site, it’s likely based on commissions from ticketing flights through its booking links. So, make sure to support the page by using these links if you find the service useful. Decide exactly how often you want to hear about flight deals. 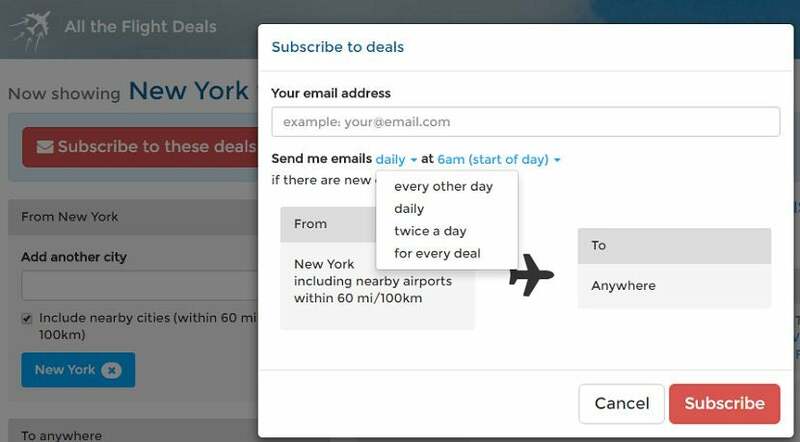 Free and highly customizable email subscription: If you’d rather be alerted about flight deals than check a website, All The Flight Deals has a solution for that too. Chose your origin airport(s), destination preferences and how often you want to receive an email. If you’re only looking for flights from Boston to Croatia and want to get an email immediately if such a deal comes up, that alert can easily be set up in less than a minute. 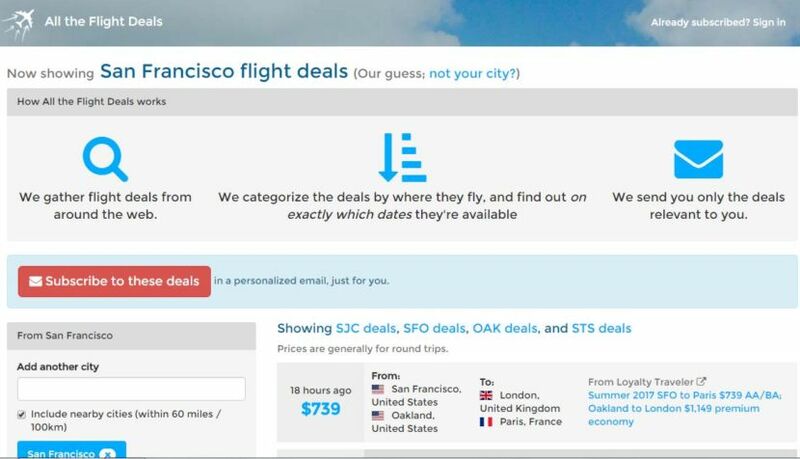 Covers many flight deal sites: All The Flight Deals has set up its scrapers to search a variety of different flight deal websites. Gives credit to original source: Many flight deal websites freely copy each other’s deals without attribution. We’re happy to see that All The Flight Deals notes the source of the deal — with a link back to the original deal’s post. That way, you can easily navigate to this source if you want your flight booking commissions to be earned by the original source. All The Flight Deals includes easy sharing options. Easy sharing options: Need to get your travel partner on board before you book an amazing fare? When you select a deal, All The Flight Deals includes a direct website link to the deal, as well as Facebook, Twitter, Google Plus and Pinterest sharing options. Includes non-US flight deals: For our readers based overseas, this isn’t another US-based flight deal website. You can search deals and set-up alerts from many non-US airports, too. Since All The Flight Deals includes sources that focus on international markets, there’s plenty of content to go around. Calendar shows cheaper prices on another airline than the posted deal, but there’s likely a catch. Calendar results include other carriers: Take the example above. Say you’re a Oneworld flyer and cheap transatlantic British Airways prices are appealing, so you want to see when these flights are available. When you scroll down to the calendar, you might get excited to see an even cheaper price. But, when you click through the options for the $420 fares, you may find that you’d need to travel on, say, WOW Air, rather than British Airways. In order to actually find the BA prices, you’re going to have to rely on searching Google Flights or ITA Matrix. 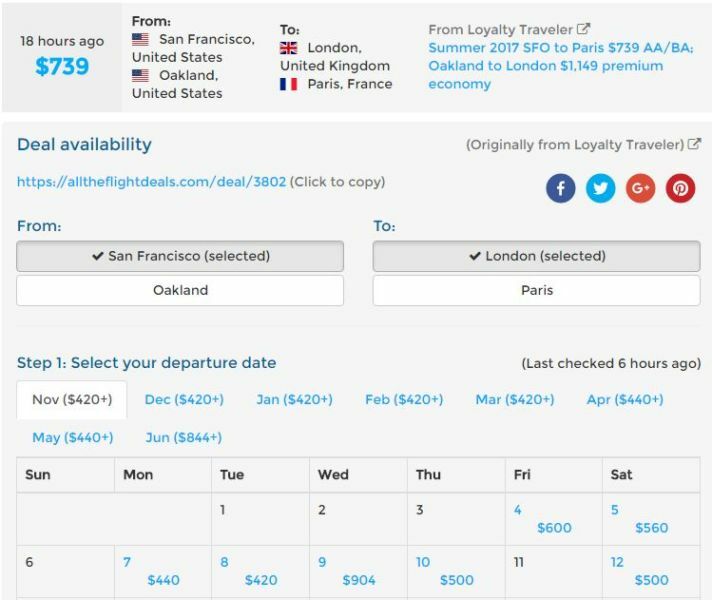 Outdated information on older deals: All The Flight Deals confirms fares and creates a calendar of fares when a deal is originally posted. It seems that this availability information is cached, so it may be out of date by the time you come across it. If you’re looking at a flight deal from a few days — or even a few hours — ago, the calendar may indicate that a date has availability at a price that’s no longer available. Although there are currently some limitations to finding and booking deals — as explained above — I expect that All The Flight Deals will become my go-to service for finding cheap fares. And I hope that you’ll find it useful as well. Have you tried All The Flight Deals?